The management was very hepful, polite and even friendly. Overall, we were lucky to choose such a nice place. Thank you. Excellent reception staff, very friendly and helpful throughout the stay. Great location, on the banks of the Marne, in safe, secure area. Very quiet and relaxing place, away from the noise of central Paris. Proximity to shops and public transport with easy access to central Paris via RER E. Well-equipped aparthotel with full sized fridge, microwave, cooking rings and coffee maker made self-catering very easy. Standard of cleanliness was excellent, bed very comfortable, good wardrobe space. Room also contained desk, table and chairs, TV, WIFI. Security very good, with access codes required for entry to building. Excellent value for money compared with city hotels. A quiet studio although it is above the highway. Position on the riverside. The bed was extremely comfy which was a plus side and the kitchen area came in handy which was a bonus! The location was lovely too looking out onto the water and was beautiful to look out onto early morning and late at night. Le personnel était très agréable et vraiment très disponible sinon côté propreté, et gentillesse rien à dire. Pas loin du rer e et de l'autoroute. L'accès sécurisé par un code et l'insonorisation des fenêtres parfait. Chambre et salle de bain très propres. Superbe vue. Close to the center of Paris and Disneyland Paris, the eco-friendly Aparthotel Adagio Access Nogent sur Marne offers comfortable, self-catering accommodations and free WiFi. The spacious and modern apartments are fully equipped with private bathrooms, satellite TV, a work desk and a kitchen area. 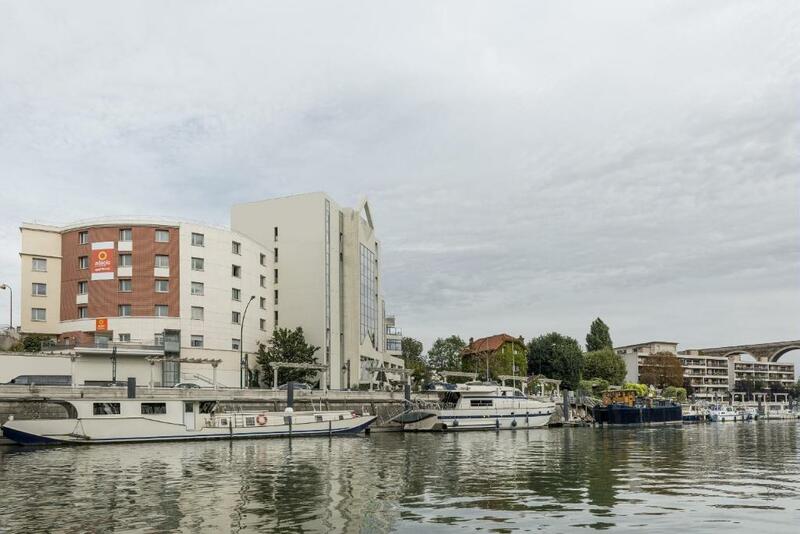 Located close to the train station, shops, a theater and the banks of the Marne river, Aparthotel Adagio Access Nogent is a good base from which to explore the surrounding area. This property is also rated for the best value in Nogent-sur-Marne! Guests are getting more for their money when compared to other properties in this city. When would you like to stay at Aparthotel Adagio Access Nogent sur Marne? Satellite TV, an private bathroom and a small kitchen area are all provided in the accommodations. Aparthotel located on the banks of the Marne, 15 minutes from northern Paris by public transport. House Rules Aparthotel Adagio Access Nogent sur Marne takes special requests – add in the next step! Aparthotel Adagio Access Nogent sur Marne accepts these cards and reserves the right to temporarily hold an amount prior to arrival. Please note that the reception closes at 21:00 during the week, and 18:00 during the weekend and on public holidays. If you plan to arrive outside the opening hours, please contact the residence in advance in order to receive access codes. Sometime the hot water is a problem. The bathroom. The toilet flushes very slowly and not fully. The insects running around on the kitchen surface was not very nice at all. When we arrived (around 6pm) there was no staff at reception even though it said in the weekday there will be a member of staff in there until 9pm. When we got to the room and started to unpack we found that there was an extremely strong smell of urine lurking in the bathroom, it doesn't matter how many times we sprayed or cleaned the bathroom the smell would not leave. The breakfast was disappointing and was nothing compared to what had been advertised to us on the website. It's more a room than an apartment like shown on advert but we are not fussy about that difference. We'll be more careful next time when using Booking.com website.